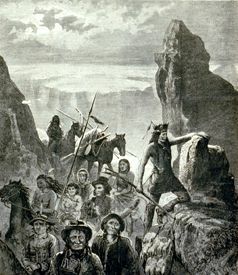 The Modoc, meaning “southerners,” were a warlike and aggressive offshoot from the Klamath tribe of southeast Oregon, occupying the territory immediately to the south of the latter, extending across the California border and including the Lost River Country and the famous Lava-bed region. The most important bands of the tribe were settled at Little Klamath Lake, Tule Lake, and in the Lost River Valley when the first white settlers began to arrive. The Modoc were nomadic hunters and gatherers, surviving on fish, game, seeds, roots, and berries. By weaving together tule reeds they made a variety of their needs including fishing rafts, baskets, moccasins, and summer huts. In the winter they made their homes in earthen dug-out lodges. Though they spoke virtually the same language as the Klamath tribe and often intermarried with them, they also had a number of conflicts with them. The first recorded contact with the Modoc was made in the 1820’s when Peter Skene Ogden, an explorer for the Hudson’s Bay Company, established trade with the Klamath people to the north of the Modoc. But the real intrusion of white settlers would not be until 1846 when Lindsay Applegate established the South Emigrant Trail between Fort Hall, Idaho and the Willamette Valley of Oregon, which provided an open route except for a short winter season each year. By the following year, new settlers began to flood the region, usurping the Modocs’ traditional hunting grounds. In retaliation, the Modocs began to attack the wagon trains and in September 1852, destroyed an emigrant train at Bloody Point on the east shore of Tule Lake. The white pioneers fought back, sending Indian fighters in to ambush the Modocs. Before long, the white settlers demanded that the Modoc be removed from their homes and placed on a reservation. In 1864, a treaty was reached with the Klamaths, the Modocs, and the Yahooskin band of Snake tribes that ceded their Indian lands and created the Klamath Reservation. An estimated 2,000 Indians were then escorted by the U.S. Army to the reservation. However, the Modoc and the Klamath were historic enemies and the Modocs‘ relationship with the Yahooskin was not much better. In addition to the tensions between the tribes, the reservation did not provide enough food for the comfort of all of them and a number of illnesses on the reservation broke out. As a result, the Modoc began to demand a separate reservation closer to their ancestral home. 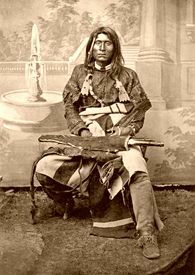 When the government would not approve a new site, a prominent chief named Kintpuash, commonly known to history as Captain Jack, led the more turbulent portion of the tribe back to the California border in 1870 and obstinately refused to return to the reservation. The first attempt to bring back the runaways by force instigated the Modoc War of 1872-73. After some struggles Kintpuash and his band retreated to the lava-beds on the California frontier, and from January to April, 1873, successfully resisted the attempts of the troops to dislodge them. In April, President Grant organized a Peace Commission to meet unarmed with the Modoc leaders in a peace negotiation meeting. However, the meeting resulted in the killing Major General Edward Canby and a Reverend Thomas. The campaign was then pushed with vigor, the Modoc were finally dispersed and captured, and Kintpuash and three other leaders were hanged at Fort Klamath in October, 1873. The tribe was then divided, a part being sent to Indian Territory and placed on the Quapaw Reservation, where they had diminished to 56 by 1905. The remainder were sent to the Klamath Reservation, where they numbered 223 in 1905. In 1907, the group in Oklahoma was given permission, if they wished, to return to Oregon. Several did, but most stayed at their new home. Today, the Modoc still live in both Oklahoma and Oregon with an estimated 600 members in Klamath County, Oregon, in and around their ancestral homelands; and another 200 in Oklahoma. Unfortunately, for those living on the Klamath Reservation in Oregon, including the Modoc, Klamath and Yahooskin tribes, an act of congress terminated federal recognition in 1954. Even though tribal leaders and the Bureau of Indian Affairs opposed the act, it was passed anyway, The act not only stripped them of federal recognition and federal assistance, it also took away some 1.8 million acres of their reservation. In 1986, the Klamath Indian Tribe Restoration Act returned their federal recognition, but did not return their land. 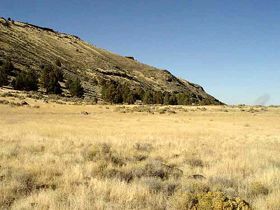 Though a small parcel was set aside for a diminished reservation, the land remains owned by the federal government rather than the tribes themselves. The present day Klamath Indian Reservation consists of just twelve small non-contiguous parcels of land in Klamath County, with a total land acreage of just a little more then 300 acres. Few of Klamath tribal members actually live on reservation land. In fact, the 2000 census reported only nine persons residing there, five of whom were white. The Modoc Tribe of Oklahoma was officially recognized by the United States government in 1978, and their constitution was approved in 1991. © Kathy Weiser/Legends of America, updated July, 2010. Very informative on the Native groups that lived in what is now Oregon. Have been researching the states history, both the good and the bad since I was a young person before home computers and the internet. Thank you for the efforts put into this site and the histories that it contains.